Here’s something I’ve done over my 20+ years as an entrepreneur to keep everyone focused on the tasks at hand while also keeping an eye on the future. Entrepreneurs usually blur the lines of what their startup is, what it will be, and what it should be. This is fine until you try to start planning around those stories. At that point, you need to be asking: What are the priorities today and how do we execute on those priorities without mortgaging the future? The reverse question is just as important: How much time do we spend working on those new things that aren’t generating revenue yet? Story A: Story with an arc that begins and ends in this episode (or maybe a two-parter). Story B: Story with a longer arc that lasts a few episodes or more. This current episode will advance the plot of Story B in smaller increments, and maybe drop a twist in here or there. Story C: Story with a much longer arc, maybe out to the end of the season or the end of the series itself. 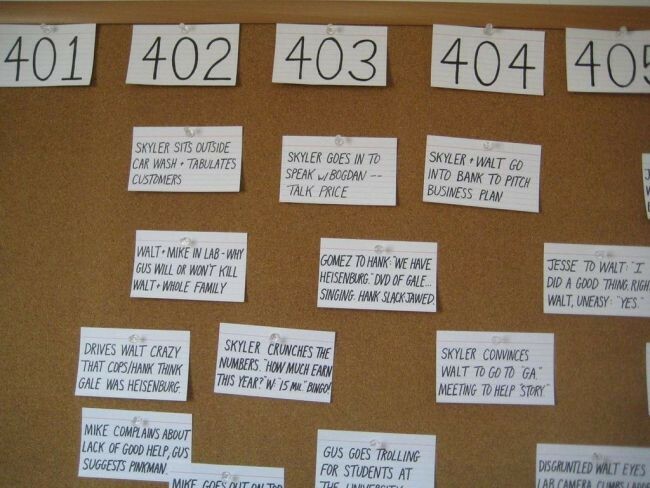 This current episode might not advance Story C at all, or it may just drop a few hints. At the end of the season or the series, you’ll be able to look back and piece Story C together, but that won’t be easy or even possible in real time. Now let’s take that story strategy and apply it to your startup, and I’ll use my most recent startup as an example. Story A is the what your company is doing today that is generating revenue, building market share, and adding value to the company. Story A is about this fiscal quarter, this fiscal year, and next fiscal year. At Automated Insights, Story A was our story for the first few years while we were known as Statsheet, a company that aggregated sports statistics and turned them into visualizations and automated content. This is how we made our money — either using our own data to generate content or using data like Yahoo Fantasy Football to generate Fantasy Matchup Recaps. While we were breaking new ground in the arena of sports stats, we were one player in a sea of players, and while automating content from sports stats gave us a competitive advantage, sports was still a highly commoditized and difficult marketplace. Story B is what’s going to open up new markets using new technologies or new products. Story B is about what you could do if the stars aligned properly or if you raised enough money for a longer runway, because Story B usually comes with a lot more risk for a lot more reward. A few years into Statsheet, when we went to raise our Series A round, we pitched using our proprietary automated content engine on all kinds of data, generating machine-written stories in finance, marketing, weather, fitness, you name it. We changed our name to Automated Insights and pivoted completely with a $5 million raise. That pivot came with a ton of risk. We had friends (and potential acquirers) in sports and we would now be making sports just a part of our story. In return, we would be one of the first players in the nascent Natural Language Generation (NLG) market, a pre-cursor to the “AI” market. It was not a coincidence that the acronym for our new company name was also AI. Story C usually involves a seismic change that disrupts existing markets, and as you can imagine, it’s a million times more difficult to pull off. Uber and Lyft are on Story C. They’re no longer known as a better taxi or for solving a specific problem. 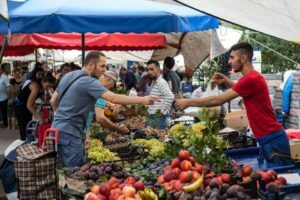 They’re about creating a market in which a large portion of people can no longer live without them. In most urban areas, ride hailing services are now a necessity, as the ability they offer to do more things cheaply has made a major impact on lifestyle. There’s just no going back. Story C was actually where my vision split from my former startup. I was focused more on real-time, plain-word insights generated from a mesh of private and public data, i.e. Alexa, Google Assistant, and Siri. The company was turning towards more of a B2B approach, first as a SaaS NLG tool, and then as a business intelligence tool. No one was wrong here, but the latter was the direction the company took. So now I’m working on a new Story A at a new startup. And I’ve got Stories B and C in my purview. So which story do you tell? Well, it depends on who you’re talking to. For the press, for customers, and for potential employees, stick to Story A — if these folks aren’t jazzed about Story A, then you’re not spending enough time on Story A. In fact, you should consider Story B and Story C to be intellectual property. It’s not the kind of thing you want to go too deeply into without an NDA or some protection in place. For your board, your investors, and your employees, focus on Story A, of course, but also keep them aware of Story B and drop hints about Story C. Story B is where you’re headed next. It might be what you raise your next round on, or it may be your next big pivot. 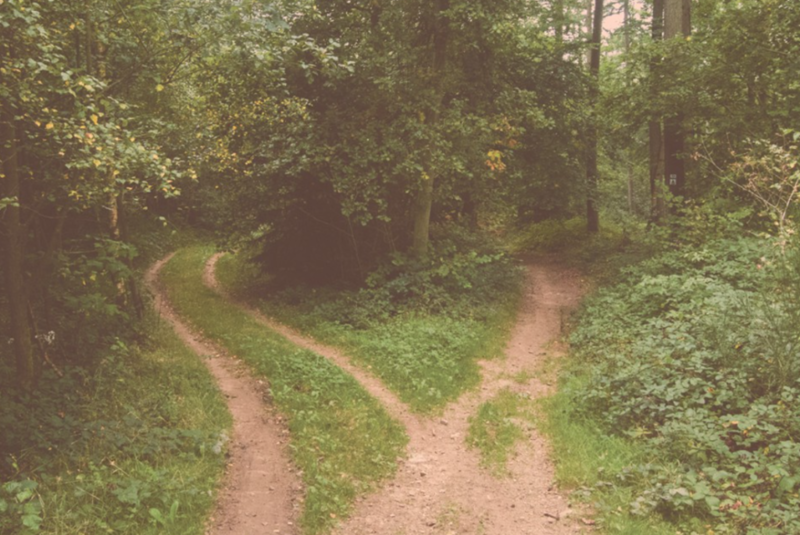 Story C is best kept in the distance until you’ve crushed Story A and made significant progress on Story B. It’s a goal, mainly, and you should just be making sure you’re not closing doors to it as you move forward. Once you get your stories straight, then it’s just about execution. But come back to them often, every quarter or even every sprint, and make sure everyone is still on the same page. Article from Medium Daily Digest by Joe Procopio. 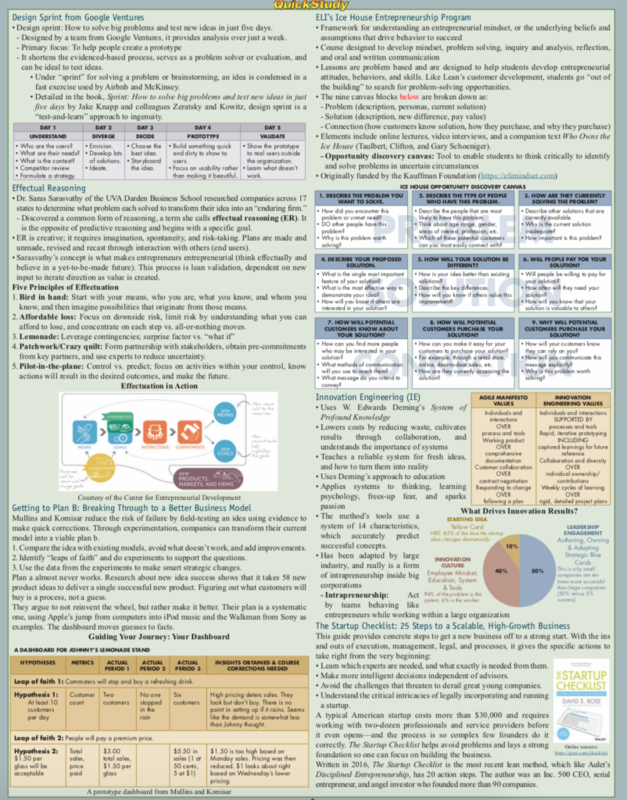 Ultimate Lean Startup, New Summary Chart. 2. 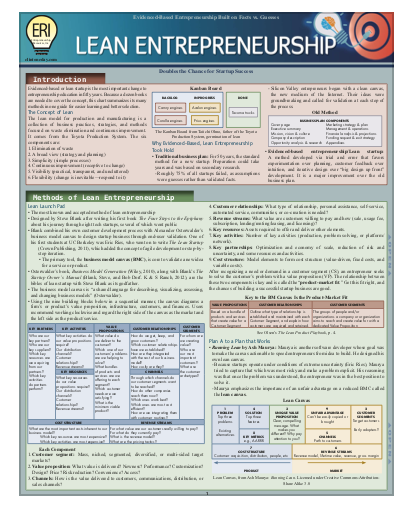 The new Lean Entrepreneurship Chart, a summary of all 15 methods. The latter will be published this month after introduction at the annual USASBE Conference in St. Petersburg, FL 23-26 January. 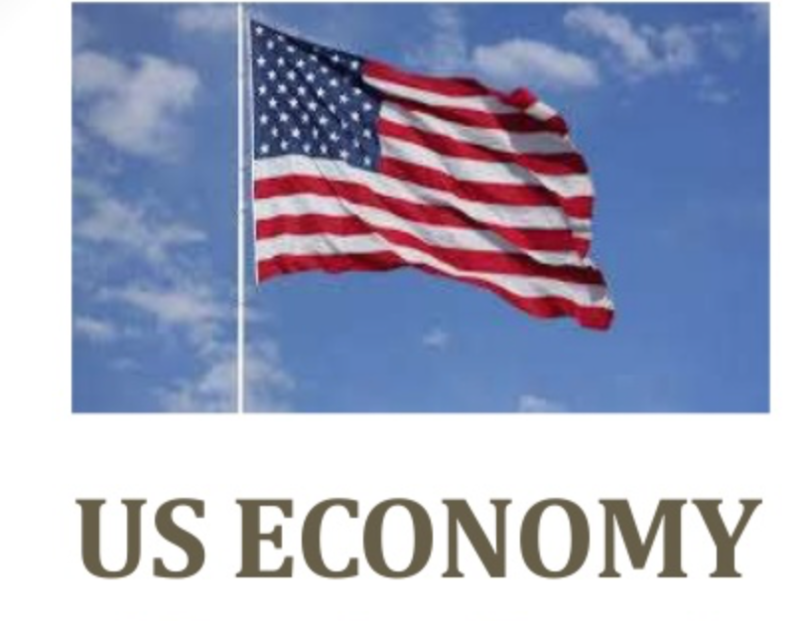 USASBE is the largest organization of entrepreneurship education hosting over 540 scholars and instructors. If you are in the startup world, I am pretty sure you’ve heard about lean startup. This is a common method used by startups but it’s often misunderstood by entrepreneurs. 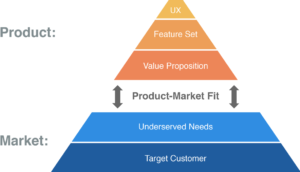 This is why, today, I want to give you the ‘ultimate’ lean startup definition. I’ve already given you the growth hacking definition and the inbound marketing definition: now, it’s the turn to lean startup to be defined. If a business owner wishes to create successful company and product, their key task is reducing different risks. Entrepreneurship is definitely a risky business and as such, one of the primary missions of the entrepreneurs is to systematically and gradually get rid of the risks. The key in this is that whenever developing a product, entrepreneurs focus on the largest risks first. As what’s mentioned before, the largest risk is the newly founded companies are rarely the manufacture of the solution or product. With today’s times of cheap manufacture, entrepreneurs can be very fast to make a product with enough effort, money, and time. The biggest risk for the entrepreneurs is that they will create a product that nobody likes to purchase. When entrepreneurs are just starting, they only have a hunch regarding the problem that potential clients face, a suitable solution as well as even the logical customer segment. Since they’re only the hunches of entrepreneurs, creating a solution very quickly, and choosing the customer segment or the entire business model very early can lead to failure. A solid strategy, good plan, and implementation of marketing plans seem like the right strategy at first because these are the things that big companies have. However, applying such traditional tools to the newly created companies do not make sense because the latter face uncertainty. The bigger the uncertainties are, the more difficult it is in predicting the future. That is the reason why planning can be exact when it is based on a stable, long history of the startup in a relatively stable surrounding that does not apply to newly created or established companies. If the entrepreneurs build products that nobody would want to purchase, this makes no difference if it is made on schedule as well as with planned resources. This statement indicates the fact that the basic task of entrepreneurs is learning which product to make at all and that’s the product for which customers are prepared to pay and in short possible time. As the solution to quick and complex changes in the environment, the new method of building a new company developed known as lean startup. Lean startup is the new look on the development of innovative products, which emphasize fast iterations of product development that is based on the new insights to the wishes of customers and including big visions or high ambitions of the business team at the same time. In today’s economy, the question “can it be built?” is not crucial anymore for the reason that nearly any product may be created since there are sufficient means of the production are available. More important questions in modern economy are whether a particular product must be built and whether it’s possible to build long-term sustainable business model around the products. Manufacture capacities of the developed countries are bigger and more developed compared to the knowledge of what the market really wants. With the manufacturing capacities reaching the point where you can manufacture nearly anything you can think of, the question of whether you can make new services or products are not in the foreground anymore, yet instead whether this makes sense to build this and if it’s profitable. For every lean startup, this is necessary that they let go as soon as possible of wrong assumptions that they can describe history exactly, even more exactly plan or predict the future and co-create this. What must come to the forefront is the realization that the entrepreneur’s assumptions or the business team regarding the market, the customers and their problems are very wrong and only through trying, discovering, and measuring patterns with scientific method can these be true. The history of the successful startups in the modern times teaches everyone that by far the most essential factor for the business success of established and new companies is a desire for verifying assumptions in the market, testing, and learning based on the small failures and looking at the problem’s right combination that brings the final huge success. Customers are what make the product into a success story. Without customers who are ready to purchase the products, it is not essential how innovative ideas are or how affordable the product is because the company will surely fail. With this, there’s an important realization that bigger uncertainties do not do only bring challenges and disadvantages to long-term business planning. Bigger uncertainties are also chances because innovation and uncertainty go hand in hand. Without the first, there’s no opportunity for the second. The disruptive innovations may happen in an environment where final products, marketing, value offers, prices, and sales channels are at most informed guesswork, yet more like a complete unknown. 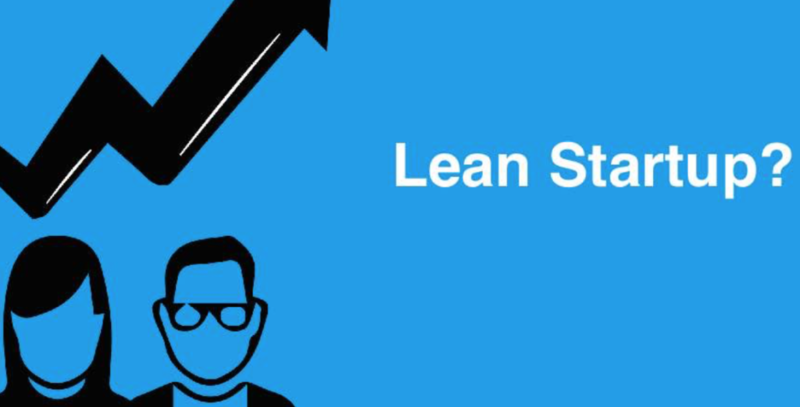 Now that you got a quick introduction, it’s time to give you the lean startup definition…Let’s define lean startup: lean startup offers a scientific approach to managing and creating startups and acquires the desired product to the hands of the customer faster. The method of lean startup teaches you how to drive the startup, when to turn, how to steer, and when to persevere and grow businesses with optimum acceleration. This is a principled approach to a new product development. A lot of startups start with an idea for products that they think people like. Then, they spend months or years perfecting the product without showing the product even in very rudimentary form to the potential clients. 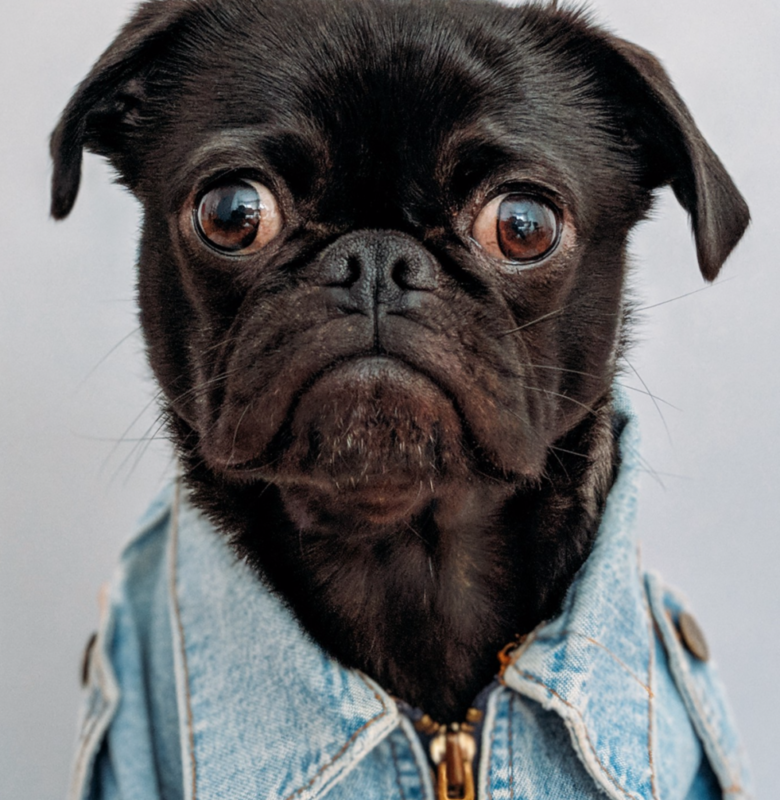 Once they fail to reach broad uptake from the customers, it’s often due to the reason that they don’t speak to prospective clients as well as determined whether or not the product was exceptional. When the customers communicate ultimately, through their indifference, that they do not care about the idea, the startups fail. How WeWork Became the Most Valuable Startup in NYC. 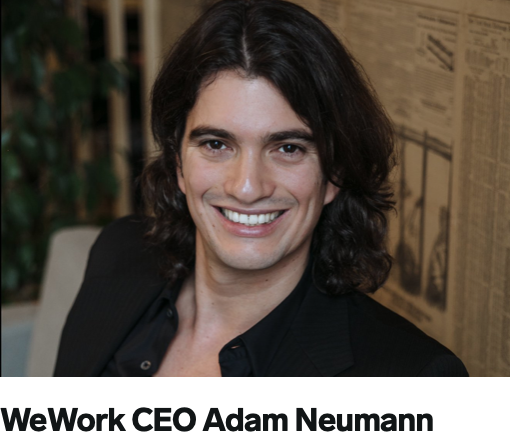 Adam Neumann is the CEO of super-hot office rental company WeWork, the most valuable startup in New York City. This year WeWork ranked third on our Silicon Alley 100 list. WeWork, which has raised $969 million in funding at a $10 billion valuation, is the 11th most valuable startup in the world. But Neumann, who was born in Israel and moved to the US in 2001 after serving as a navy officer in the Israeli military, had an interesting venture before he launched WeWork. McKelvey and Neumann saw that the building they both worked in was partially vacant, and they got the idea to open a coworking space for other entrepreneurs. After a lot of convincing of their landlord, McKelvey and Neumann opened the first floor of a startup called Green Desk in 2008 — an early incarnation of the company that would eventually become WeWork. The focus of the company was sustainable coworking spaces featuring recycled furniture and electricity that came from wind power. Green Desk quickly took off. But Neumann and McKelvey eventually sold the business to their landlord Joshua Guttman. “Within a week we realized that being green should be a part of anything we do, but community is really the future of work,” Neumann told Business Insider. The two founders knew they had a good concept. They pocketed “a few million” from selling Green Desk, according to The Real Deal, and founded and launched WeWork. WeWork in its current iteration opened its doors to New York City entrepreneurs in April 2011. Since then, the company has expanded to cities across the country, and recently opened its doors globally too. WeWork’s coworking spaces give entrepreneurs space to work, and come equipped with amenities like free beer, stocked fridges, and Foosball tables. In total, WeWork has 54 coworking spaces in New York, Boston, Philadelphia, Washington DC, Miami, Chicago, Austin, Berkeley, San Francisco, Los Angeles, Portland, and Seattle, with additional international locations in London and Amsterdam, along with new locations in Tel Aviv and Herzliya in Israel. WeWork’s 30,000 clients range from startups — Business Insider uses a WeWork space out in San Francisco — to big companies like Merck and American Express. Individuals can also buy packages starting at $45 and rent a desk for a day. WeWork has its its critics. It recently settled a dispute over its custodial services. And though WeWork became profitable as of this summer, some skeptics believe its financials may not support its valuation, suggesting it could be part of a new technology bubble. And there are basic concerns about the sustainability of its business model. WeWork, of course, is an alternative to real estate companies for freelancers and companies. And the real estate business can be risky. One argument against WeWork goes something like this: Lots of startups make up WeWork’s client base, so if there’s a downturn in the market, and it becomes difficult for startups to raise funding, WeWork might have trouble staying profitable — its clients wouldn’t be able to pay the rent.